The coming of the Holy Spirit. Note that most of the songs listed for this reading are good for many of the other readings this week. VU381 Spirit of life come unto me (Carolyn McDade) A lovely simple song beckoning the Spirit. It's a little bit "me, me, me", but a good song of personal devotion. *ATAR643 Fire of prophet cool wisdom of sage / Spirit lead us (Paul Somerville) An excellent song about knowing God through sacred stories, and being part of God's sacred story. This would be an excellent song for the entry of scriptures at the start of the service, or to sing before the readings. It may be best sung first by a soloist. You could use it often during the Pentecost season, so it would be good to teach it now. *ATAR607 Spirit of dreaming (Alison Campbell Rate) Good open-ended words of hope for the coming of the Spirit, and a catching soothing melody, that gets a nice twist in the chorus. Lyrics snippet. *BUC Song Project Tower of Mercy (Dave Brown) A new-ish song from Dave. It would be great to have the musicians play this. "O sweep us into your great breath of life"
NCH056 Breath of the living God / Soplo de Dios viviente (Osvaldo Catena) A joyful song in Spanish or English, set to a traditional Norwegian folk tune. 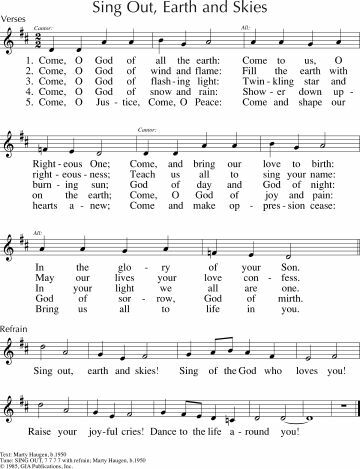 The chorus is particularly great "Come now an dlive within us, come let your gifts enrich us, Breath of the living God, our Creator Spirit, Eternal Source". *Online Resource Set us free for Freedom (Shirley Murray) Good challenging words, and two possible tunes, which are BOTH good, but quite different. The Klusmeier tune (1st in the download) is a good folk hymn tune, while the Gibson tune (2nd in the download) is more upbeat with a rousing chorus. Lyrics and free sheet music. Tune In Spirit of the Father, Spirit of our Mother / Alive in me (Sheree Anderson) Catchy boppy pop song about God's spirit within us and within the world. Music sample, sound sample and lyrics. Good for kids. Free downloadable songbook. 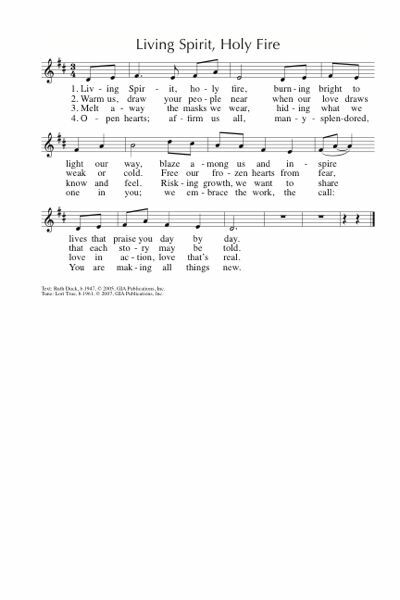 SP&P025 Breathe on me O breath of God (Austin) A lovely simple song which can be sung as "breathe on me" or "breathe on us" depending on whether you want a personal or communal song. G(3)549 Living Spirit Holy Fire (Ruth Duck) Lovely words, and a simple flowing tune. Lyrics and melody line. Sound sample. *GA183 Come Holy Spirit the spirit of Wisdom (Christopher Willcock) Good song. It's in 7/8 so you can't go wrong. The words are also excellent about God-with-us and the coming of the Spirit This is also in New Song in an Ancient Land Vol 1 (in the Liturgy Library at BUC). Clunky sound sample. *NCH287 / FFS11 Come teach us Spirit of our God (Shirley Murray) Excellent words and a good tune. SP&P005 Holy one may your presence here (Christopher Grundy) A joyful and quite quick chorus seeking enlightenment from the presence of Christ. NCH272 / VU195 / GtG289 / PH128 / W&R334 / Cha237 On Pentecost they gathered (Jane Parker Huber) A simple story-telling hymn. Tune is a simple traditional tune. Lyrics. AoV1-095 / G(II)324 / GC459 Envia Tu Espíritu (Bob Hurd) My other favourite holy spirit song. A catchy latin rhythm; verses are in English and the chorus is Spanish – not too hard for non-Spanish speakers, though. AoV2-058 Pulsing Spirit rippling river (Dolores Dufner) Excellent words sung to the familiar tune BEACH SPRING. Lyrics. New words to old tunes. TiS 711 / ATOK 334 / Iona (M&G) / WoV681 / VU383 / SFFS 2124 / GtG283 / G(II)330 / StF038 Come O Holy Spirit / Wa Wa Wa Emimimo (Nigeria) This song is just fun. And very easy. Try to sing it in its original language (Yoruba), it sounds a bit inane in English and it’s not hard!! Encourage your congregation to dance a simple side-to-side step to this; they will enjoy it even more. If we can’t go a little crazy on Pentecost, what hope is there for us, really? A good song to help us remember that our faith is global, and to think of the church and all people in Africa. Youtube of John Bell teaching it Good for kids. A&M233 / CP(E) 365 A mighty wind invades the world (Stanbrook Abbey) Pentecost Excellent strong imagery of the Spirit moving through the world. Largely inclusive, but for a Trinitarian verse at the end. CH589 / A&M240 Come Holy Spirit / Breath of Heaven (John Bell) A lovely simple repetitive song. Includes verses like "Come , Word of Mercy" and "Come to disturb us"…. SP&P091 O Great Spirit earth sun sky and sea (Adele Getty) A beautiful and simple meditative chant on the Spirit. This can be sung gently, or more energetically like a Native American chant, as here. *NCH058 / CH618 / AA125 Spirit of love you move within creation (Shirley Murray) Good words with a theme of the Spirit working a loom. A range of tunes for this, both familiar and new. I like the Colin Gibson tune (WEAVER), but it can also be sung to PERFECT LOVE. New words to old tunes. *FFS58 Spirit of peace (John Murray) Great words. Good simple chant, which may also be used as a round if you sing it to tune (ii). Ezekiel and the bones! Many of the songs listed above will also fit. WoV658 / ELW506 / URW078 The word of God is source and seed (Dolores Dufner) "The Word of God is breath and life; It comes to heal and wake and save. So let the Spirit touch and mend and rouse your dry bones from their grave". Lyrics (downloads a pdf). God as Creator, Sending the Spirit to renew the face of the earth. Many of the songs listed above will also fit. TiS 65 Send forth your spirit O Lord and renew the face of the earth (Shirley Murray). A lovely refrain and a good paraphrase of the Psalm. The refrain doesn't really work well as a chant. The cantor part can be read if you don't have a cantor. STB114 Come holy spirit (I-to Loh) A lovely 3 part chant. The congregation can sing one part, while a soprano and tenor cantor (or groups) sing the other two parts, or you could split an adventurous congregation into 3 parts. Will need to be taught. MV015 / GA186 Holy Sacred Spirit (Monica Brown) Gentle chant. Can be used without the cantor part. "Holy Sacred Spirit, breathe your breath on us". Good for kids. *PfAS104D Send Forth Your Spirit O Lord (Steven Warner) Energetic hymn of praise. You could use both the verses and chorus, or only the chorus, as a Psalm refrain. PfAS104G Lord Send Out Your Spirit (Duba) A simple Psalm refrain. *AoV2-051 / G(II)325 / GC463 / GC(II)481 / G(3)555 Spirit Blowing through Creation (Marty Haugen) Excellent. Don't rush or it's hard to get all the words out. The spirit intercedes for us. Again, many of the songs listed above will work well with this theme. FFS11 Come teach us Spirit of our God (Shirley Murray) Excellent words and a good tune. Music by Heart 19 The groaning of the spirit (Benjamin Law) A round with an ostinato (a higher part) and an optional drum part. Would need to be taught during worship, or shortly before. Tune In: Spirit of the Father / Alive in me (Sheree Anderson) Catchy song about God’s spirit living in us. "Take hold of the hope that I give, trust in me, reach out for the love you can live, eternally”. Free downloadable songbook, lyrics and sound samples. Good for kids. Tune In: Father of earth, Mother of sea (Dave Brown) A latinesque song about the Spirit being with those who are victims, prisoners and the sick, as well as present in our prayers. Note particularly the phrase “Spirit who prays with us while war goes on… pray with us Lord”. Free downloadable songbook, lyrics and sound samples. AoV1-061 / ATOK 355 / SFFS 2194 / G(II)521 / GC723 / GC(II)707 / ZSS110 / SgTJ1035 / StF697 Freedom is coming (South African) Excellent and lots of fun, especially if you have a keen African-style drummer in your congregation. It's really worth teaching the parts to your congregation before the service. It can get a bit boring if the congregation don't know they get to listen to the other parts! Partial sheet music, sound sample (search for Freedom is coming). Good for kids. TiS 417 / AoV2-133 / ATW 448 / VU387 / StJ / WoV683 / ELW397 / AA94 / HPP237 / GtG293 / PH323 / CP657 / W&R135 / Cha244 / URW203 / StB220 / VF051 Loving Spirit, Loving Spirit (Shirley Murray). There are about a zillion tunes set for this. I prefer FELICITY (by Colin Gibson TiS 417), but also like RESTORATION and OMNI DIE. Lyrics are here. URW154 Holy holy holy you are whole and holy (Per Harling) Very simple tune. 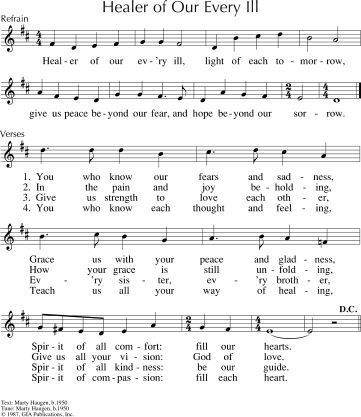 Would be a nice Sanctus to use during communion this week if you like, even if you just used the chorus. TiS 421 Where the Spirit is there's freedom (Per Harling) Fun and good; excellent fun for the pianist! Lyrics. Good for kids. NCH520 / LBW441 / ELW402 / AA033 / CP557 / W&R475 / 82Hml-698 Eternal Spirit of the living Christ (Frank von Christierson) There are many tunes to these very honest and realistic words. For a more modern alternative, Gibson's tune in AA (ARGYLE STREET) is quite good. Lyrics. ATW 463 / Iona (T1AU) / ELW721 / SFFS 2219 / A&M835 / GtG750 / GC(II)451 / G(3)528 / W&R296 / URW436 Goodness is stronger than evil (Desmond Tutu) Words from Archbishop Desmond Tutu. "Victory is ours, victory is ours, through him who loves us". Some congregations change the last line to "Compassion is ours, compassion is ours...". It depends on the context in which you sing it, I suppose. Sound sample. Good for kids. Worldmaking.net / SP&P081 / CP086 More Than We Can Ask (Richard Bruxvoort-Colligan) A great chant for use during intercessions. Very simple and genuine. Sample and lyrics here. Worldmaking.net O Tender God have mercy (Richard Bruxvoort-Colligan) A nice chant which would be great for the prayer of confession. Lyrics and very breathy sound sample. AoV1-139 O God Nothing Can Take Us from your love (Christopher Walker) Good refrain. Good verses. Cantor and congregational response. TiS 380 / AHB 303 / NCH253 / CH419 / UMH308 / VU173 / LBW145 / ELW376 / A&M218 / HPP203 / GtG238 / PH122 / CP210 / CP(E)160 / W&R310 / Cha218 / Srce694 / Lau287 / StF313 / MP689 Thine be the glory risen conquering Son (Edmond Budry) One of the few older hymns that doesn't require updating, and beautiful harmonies... A great classic hymn! Lyrics and tune. Oldy-but-a-goody. The spirit of truth guides us into all truth. Again, a lot of the songs listed above will also fit with this passage. TiS 412 / AHB 324 / ATE 251 / GA184 / G(II)328 / GC468 / CP651 / W&R130 God sends us the Spirit to befriend and help us (Tom Colvin / people of Ghana) I like this song from Malawi, but the lack of inclusive language for God sometimes drives me a bit crazy. In Tom Colvin's book "Come Let us walk this road together" he uses more inclusive language than many hymnals that include this song. That is, he writes “God sends us the Spirit” instead of “God sends us His Spirit” and "Spirit of our Maker" rather than “Spirit of our Father”. Good for kids. CH608 Spirit of truth and grace (Iain Cunningham) Great words. They are not completely inclusive in their language for God, but the image of God as Father is a necessary part of this beautiful hymn, sung to a simple folk tune. What ideas do you have? Please share your ideas in a comment below so others can see it, and so I can include your ideas in the future. Written in a hotel in Daegu, South Korea. For the Romans 8: 22-27 reading, Loving Spirit, Loving Spirit (Shirley Murray)is also found in Voices United 387 and called Loving Spirit. I also want to thank whoever goes to all the hard work of putting these hymns together. It is such a blessed resource and helps me find hymns that I would not have otherwise considered.